... or e-mail me at polt@xavier.edu. My uncle was Norman Saksvig and my family inherited his chrome-plated Smith Corona typewriter. I still have the top-most piece of his world championship trophy - a brass scrulpture (trophies were better back then). I keep this item above my piano. Norman loved my piano playing. In the sixties after he passed away my mother also inherited his 1959 Impala convertible - white with red leather interior. I was permitted to drive this car as my own for a couple of years until my parents sold it. Wish I still had the typewriter and car! Thanks for your interesting story! Just to add to your typewriter repair shop list, is Dennis Johnson at Precision Office Machines, 115 5th Ave So. #100, Lacrosse, Wisconsin 54601. His cell # is 608 386-1796, and e-mail denjohn@gmail.com. He's a very nice man, still repairs typewriters, and is reasonably priced. Thanks, I will add him. 773 - 581 - 4111 They have been in business since 1912, so I asked if they were related to Franz Wagner of "Underwood" fame, but he said no. They do have the original style spools, and ribbon for the classic Royal typewriters! They're 25.00, but available for those who need them. Thanks again for your contributions to our community!! Boy was I tempted a couple of days ago. www.shopgoodwill.com had a SCM 12 electric portable (with manual carriage return and backspace), for $4.95 opening bid, and no takers. It was in Knoxville, so freight would have added about $22 for me. But what attracted me: it was Italic type! I've always wanted a typewriter with script, but after getting a script element for my Selectric, I've decided it is too much. I want something sort of personal and informal, but easy to read. Unfortunately I don't have room for another typewriter. This one I would want someplace where I could have it ready for typing a short note or envelope. Back in May when you were in Tampa, you took pictures of a ?? Princess. But what caught my notice, was a smart looking LED table lamp, with a thin shade, on a slanting, swiveling post. After much searching, I found it at www.ylighting.com, for $399!. I couldn't believe that a hotel would spend that for a lamp that could walk out the door, even at a 50% discount. The cheapest I could find it was $289 or something. That room must have been expensive. But it made that Princess look good. I enjoy your blog immensely. Don't ever give it up. Thanks, Phil! Yes, italic machines are cool -- and pretty hard to find. Maybe the hotel got a great deal on a truckload of lamps? "Don't have room for another typewriter"? Balderdash! There is always room for Just One More. I thought in the last twenty or so years, that the typewriter has finally died, and that typewriter hobbyists like me would take our places alongside the blacksmiths and carriage drivers. But to my delight, I find that the typewriter preservation movement is very much alive and well. I have been a typewriter hobbyist for 35 years, and have seen a great deal in the world of these fascinating machines--and hope to see a great deal more. I could tell stories about the rare typewriters I've owned (and let get away), strange ways I've gotten a few of my machines (one turns 100 this year! 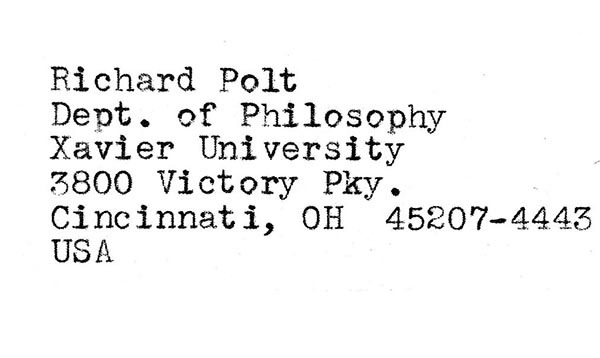 ), and all the typewriter mechanics I've met over the years (one guy's business sign hangs in my bedroom). I'm not sure just how I got into typewriter repair and restoration, but I think when I got jealous of my sister's ten-year birthday present (a toy typewriter), and whenever I took apart Maw's typewriter is when it happened. Anyway, long live the typewriter!!! I'll try to happen along here and again to share a story or two. Hi Richard. I was thinking of getting a typewriter and came across your blog. I have a more modern electric typewriter (340 Correctronic), but I'd really like to get a mechanical typewriter. I've been looking at ebay, but I'm totally clueless and I have no idea if any typewriter I purchased untested would be salvageable. I definitely want something that works. I saw that you are located in Cincinnati and I was wondering if you have typewriters for sale? I'm only up in Mason, so not a far trip. Hi Leigh. Yes! I restore typewriters for sale through The Urban Legend Institute in Northside, a shop that supports the nonprofit WordPlay Cincy. Send me an e-mail and I can provide more details (polt@xavier.edu). Thanks! I actually have several digital volumes of this publication. It makes for very interesting reading. Hi! This might be a long shot, but do you have any idea what spool an Underwood 142 (portable) would take? Only, I dug out an old typewriter that hasn't got a spool, and I have no clue which to buy because (for some reason) the Underwood 142 has zero information on it anywhere! Thanks! Hi there. The Underwood 142 was made by Olivetti and needs a ribbon spool specifically for Olivetti. It should be a half-inch-wide ribbon with eyelets on the end. One good source is Baco Ribbons, bacoribbon@sbcglobal.net. I hope you have the nuts that screw down to hold the ribbon spools on; if not, look for some nuts at a hardware store that will fit onto the shafts. Hi there I really like your blog. I remember typing a lot of letters and essays on my mum's manual white portable machine from the mid-1970s onwards. This was in Europe and I think it was an Olympia with a very nice font - slightly smaller and more rounded and stylised than standard Courier-type fonts. The machine itself had a fairly upright shape and it stood out against the very flat looking funky portable ones that became popular in the 1970s, but it was still a portable in a carry case with removable lid. I think the machine body was made of plastic. If anyone knows what model that may have been I would appreciate knowing it (or based on the description of the font, has a suggestion which other make and model it could have been - the font is quite distinctive). I very recently bought a 1965 Facit TP2 for $10 for my daughter who fell in love with it. It needs repairing but I have found a local guy. As an aside, it was as recent as five years ago that I remember still needing a typewriter for certain legal forms (which are now all online). So it took a long time for typewriters to be totally removed from offices - much longer than people realise. Thanks for your interesting comment. At my university, some forms still must be filled out on paper, which I'm happy to do with one of my handy typewriters. A TP2 for $10 is a real steal! It might be that your mum's machine was an Olympia SM8 or SM9, but they have metal bodies. Thank you for your quick reply. The Olympia SM8 looks very close to what I remember so maybe it was metal after all. The closest typeface to my memory is Senatorial No. 71 but I would have to dig up an old letter to see. I liked it a lot. The TP2 (green) is definitely in used condition but it does have the original carrycase which still locks and the handle is sturdy. The whole thing cost me about US$7 ($10 local currency). The repair guy said it would probably be about US$35 to get it going. Even if it was double that, I'm pretty chuffed. Any recommended products or handy tips on how to clean the black leather-look vinyl carrycase and what to use on the rusted clasps? Scrubbing Bubbles works well to clean cases like that. On the clasps, I would try superfine steel wool. I've read a comment of yours that you have repainted typewriters. I'm repainting a Skyriter. Can you advise what kind of paint to use? Paint by spray can (limited colours) or dip (too heavy a coat) or roller? Primer first? A sealant? Any advice would be greatly appreciated. Essentially, you remove the body panels, strip the paint (or just sand it a bit if you don't mind the remaining texture), apply primer, and apply the color. A clear coat on top of that can be nice. I use spray paint; you can find many colors at a hobby store. Be sure to give each coat enough time to dry. There are more tips and ideas in Chapter 7 of my book. Enjoy! Hi Richard! My name is Iker and my from the south of Spain . I've loved typewriters since i was a child .The past year , with 17 (Today 18) my interest in typewriters returned to my mind incredibly stronger than afterwards. I bought a second hand typewriter called Olympiette de-luxe, but it was poorly made and didn't type well. this year I bought a brand new ( i found one , and pretty cheap) Olivetti Studio 46 typewriter. its wonderful but I have to find two little metal cilinders that are missing from the carriage and that are allowed to select the fast space key or something. I'm about to buy your book this summer. My english is not as good as I would like to but if there are not too many technicisms I think I'll manage to read it. The point is (I'm planning to buy an Olivetti Lettera 42 , less heavy) that I've seen that royal is still selling brand new ( I love braqnd new typewriters ) , like the Royal Epoch or Royal Epoch Escrittore II... My question is , as I've read a bad critic from you to this machine at your blog, if there is any other place where I can buy or where can I find bran new typewriters , with high quality ( with spanish keyboard , for sure). Is there any project out there to take our beloved machine back to the factories? Hi Iker, Thanks for writing. I think the new Nakajima typewriters are very good, if you like electronic daisy-wheel machines. But there are no new manual typewriters of high quality. Is it possible in the future? Maybe ... I speculate about this question in the final chapter of my book. ¡Espero que te guste! Hi Richard, I'll write you a real letter later properly introducing myself, but in the meantime, I am looking for suggestions on a typewriter that would be easy to remove the type bars from (and I will be replacing them as well). While I do plan on learning to repair my typewriters, at this point I don't know my loose dogs from a hole in the platen, so would appreciate a suggestion. Preferably something not too rare or expensive as it's for some experimentation. Any ideas? Hi, thanks for your comment. It's not really difficult to remove the typebars from most typewriters by sliding out the curved rod that serves as their fulcrum. Ideally you have a similar curved rod that pushes the old one out, but that's not required. I think some Smith-Corona portables allow you to remove a typebar without removing the fulcrum, but it takes some finesse. 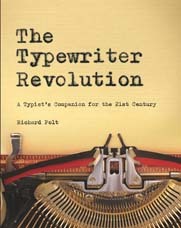 Hi, I don't know this model but I recommend researching on typewriterdatabase.com. Ok, thank you anyways. Keep up the good work! Hola. Un conocido me dijo que te podía consultar para averiguar sobre una máquina que tengo. Es una Remington 5 con teclado en ruso. ¿Que me podrías contar sobre ella? Pues es un modelo común de los años 30 y 40, pero no suele encontrarse en ruso, así que tu máquina es especial y debe tener valor. Cuánto, no puedo decir exactamente. Por favor envíame un mail a polt@xavier.edu si quieres discutir más. Ha, thanks! This is just an image I saw on eBay. I find lots of images online that I use as backgrounds for the blog. But my friend Leigh Whitaker has been creating actual stamps from images of old typewriter poster stamps. Write to sleighwhitaker at gmail. This is Vinny McFeats (Andrew McFeaters) from the Antique Collectors group on FB. I've left FB to escape distraction and Zuckerberg's watch, but I do miss the typewriter groups. I am curious, is there a particular reason why you chose Blogger over Wordpress for blogging? I've writing a typecast (mostly poetry) on Wordpress (https://theuntimelytypewriter.wordpress.com/), and am still early in the process (albeit I've assigned plenty of blogging in courses). In any case, I hope you are well. I've enjoyed your re-posting of poetry on Wordpress. Hi Andrew, I think I looked into Wordpress when I started, but it seemed more cumbersome. Since then, they've redone it and it's probably easier and more modern than Blogger. Thanks for the tip on your blog, I will add it to my blogroll and typosphere.net. Thanks, Richard. It seems like your blog acts like a hub for other blogs. I’ve trying to envision a way to create an underground alternative to the Facebook groups. Naturally, the blog platforms competing against each other don’t want to make that easy. In any case, your manifesto is ringing more and more true for me every day. Hello, I am Aneesh Manangath from India.i have always fascinated by letters, when i was in 8th standard, i tried to learn type writing in India,unfortunately i cannot continue it.My father is a writer and we had a mechanical press, but sold it.He had a type writer too. when i read story of Indian type writer company Godrej stopped their factory, I felt unhappy.Any way i am still a typewriter enthusiast.Thank you for your wonderful blog. I have loved reading your website, and I'm a proud owner of your typewriter pad! I was wondering if you had any advice on an issue I'm having with my Olympia SM3. Everything works great, except that the type is very faint on the page. I have tried a new ribbon (a ribbon which worked great on my other typewriter), and I've tried two thicker backing sheets. It almost seems like the typeslugs aren't striking the platen sometimes, unless I slam my fingers down. Is there an adjustment I can make to move the platen closer to the typeslugs? This is the case in stencil mode too, so the ribbon advance isn't all the problem, but I also have realized that the ribbon is not advancing, so that explains why it gets progressively lighter. Do I have a double problem? Hi Graham, that does sound like a double problem. The ribbon advance may be easier to fix; one of the pawls that advance the ribbon spools may have lost a spring, or maybe the mechanism needs cleaning. It sounds as if something is blocking the typebars, too, but it's impossible for me to diagnose it remotely. All I can suggest is that you observe all parts of the mechanism closely as you slowly bring a typebar up toward the printing point—or else bring this machine to a professional. Good luck! I found your blog while trying to research old typewriters. My family is originally from Chillicothe, Ohio and my great grandfather ran the Chillicothe Typewriter Co. I was wondering if you had seen any of these machines with that detail or with Mannarino (his last name). I was wanted to find one as a gift for someone in my family. If you have any information, please let me know. I'm available at my email. I can't see your email. But no, unfortunately I don't think I've seen such machines. I'll be on the lookout!